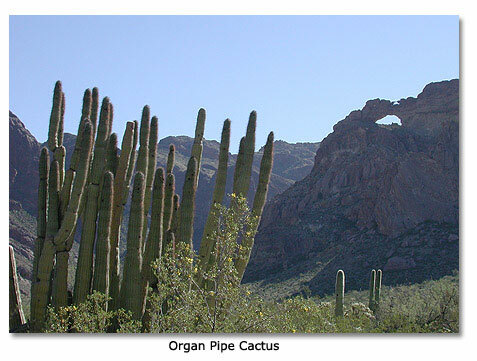 Organ Pipe Cactus National Monument celebrates the life and landscape of the Sonoran Desert. Here, in this desert wilderness of plants and animals and dramatic mountains and plains scenery three unique desert habitats converge within 500 square miles. The monument exhibits an extraordinary collection of plants of the Sonoran Desert, including the saguaro and organ pipe cactus, a large cactus rarely found in the United States. There are also many creatures that have been able to adapt themselves to extreme temperatures, intense sunlight and little rainfall. Sonoran desert plants and animals, found nowhere else in the United States, are protected throughout the monument and elsewhere in Arizona. Organ Pipe Cactus NM Map - Map to help explore the park. The Kris Eggle Visitor Center is open daily from 8am to 5pm Mountain Standard time. The Center is closed all federal holidays between April 1 and December 31. However, even if the Kris Eggle Visitor Center is closed, the remainder of the park is open 24 hours a day, including all holidays. The campgrounds, roads and trails are subject to periodic closures. Please check with the Kris Eggle Vistor Center for more information. Visitation is highest in February, March and April; lowest in June, July, August and September. 224,458 people visited the monument in 2014. Check with the park for current fees. Click here to review camping options. The Kris Eggle Visitor Center at Organ Pipe is a good place to begin your visit. Hours: 8:00 am to 5:00 pm daily, year round, except on major holidays. Features: Information, exhibit area, video or slide presentation, bookstore. Programs/Events: Ranger programs, including guided hikes, are given January through March, and occasionally in December and April. Motels, gasoline, groceries, trailer parks, laundries and other services are available in Lukeville, Why, Ajo and Sonoyta, Mexico. Topographical map at Kris Eggle Visitor Center provides visitors another way to understand the geography of Organ Pipe. The Kris Eggle Visitor Center lobby, auditorium, exhibits, and bookstore area are fully accessible. For the visually impaired there is a relief map of the monument and a touch table with a variety of items. Drinking fountains outside the building are fully accessible. Restrooms in a nearby building are accessible with assistance. Behind the Kris Eggle Visitor Center is an accessible 100-yard, hard-surfaced nature trail suitable for scooters and wheelchairs. 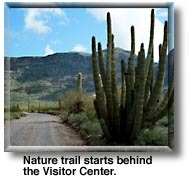 This level, gently winding trail offers close views of many plants and birds native to the Sonoran Desert. The Twin Peaks Campground's restrooms and drinking water facilities are fully accessible, with some sites equipped with picnic tables designed for wheelchair and scooter users. For more information on accessibility at Organ Pipe NM, please click here. Beware of the cactus and some dangerous wildlife. There are six varieties of rattlesnakes as well as Gila monsters and scorpions. These animals play an important part in the ecology of the desert and should not be harmed. Visitors should be prepared for desert walking. A hat, sunscreen, comfortable and sturdy clothing and shoes, and a flashlight are necessary. Avoid hiking mid-day in summer. If you get hurt or lost, stay in one place to conserve water and energy. Signal for help; three blasts on a whistle is a well-recognized distress call. In remote areas, a large "X" marked on the ground by any means visible from the air will signify that help is needed. Carry a signal mirror. Carry enough drinking water, one gallon (four liters) per person per day. Most visitor injuries in Organ Pipe result from car accidents. Drive within the speed limit and watch for animals grazing along the shoulders of the road, especially at night. International Border Vehicle Barrier: In 2004, Organ Pipe Cactus National Monument undertook the work of constructing a vehicle barrier along the south boundary, which also happens to be the international border with Mexico. It stretches 23 miles of the southern boundary. It was designed to stop vehicles from driving around the US customs offices in Lukeville on Hwy 85, or up through the desert wilderness instead of Hwy 85. Respect the boundary. Visitors should be aware that drug smuggling routes pass through the park. If you see any activity which looks illegal, suspicious, or out of place, please do not intervene. Note your location. Call 911 or report it to a ranger as quickly as possible.